Thrive Strawberries are one of our top-sellers because they can turn a simple recipe into something spectacular. 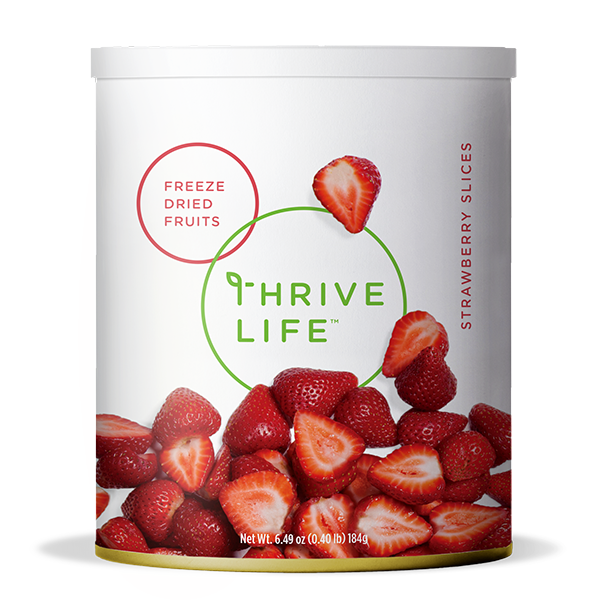 Thrive Strawberry Slices are freeze-dried so they retain all their natural flavor, color, and nutrients. Try adding Thrive Strawberry Slices to ice cream, cereal, granola, or oatmeal for a fabulous burst of bold, fruity flavor. You can also use Thrive Strawberry Slices to make gourmet desserts and purées. No matter how you use your Thrive Strawberry Slices you will love their freshly picked taste. Add water (1⁄2 cup for Whole, 1⁄4 cup for Sliced) to 1 cup Strawberries; let sit 10–15 minutes. Use our Whole Strawberries for pies, compotes, and toppings for desserts. Strawberry Slices work better for adding to trail mix, granola, and yogurt for snacking on the go.